The GRAVELY HOUSE is located in the rolling countryside of Middleburg VA. 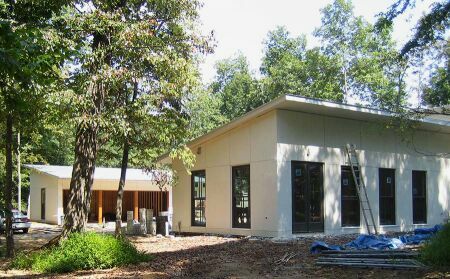 The predominantly one-story light stucco house is separate from the garage, forming an arrival court with views of both the wooded hillside below and the meadow above. A glass entry hall reveals porches which wrap the living spaces and connect the house to both tended gardens and the natural landscape.